If you’re looking for a job in retail, the weeks approaching Christmas may not be the most appealing time to focus your efforts. It’s far more tempting to ditch the classified columns and CV-polishing in favour of festive fun, or if being unemployed at Xmas fills you with dread, to bury your head under the duvet and wait for January. But with a little bit of effort – and by taking our straightforward tips on board – you can make your festive hunt a fruitful one. 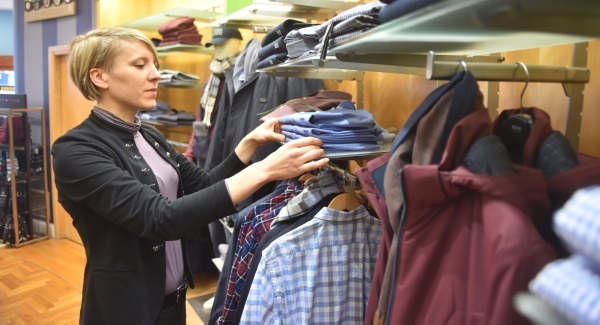 Working in the retail sector is exciting, but a rash of negative headlines in recent months – the shutters falling on a well-known Dublin retail institution as well as the downsizing of a major UK catalogue chain’s Irish operations – can be off-putting for the autumn jobseeker. Developments such as this mean that there is likely to be stiff competition in the jobs market ahead of the busiest shopping weeks, so you need to work hard to get yourself noticed. However don’t be discouraged – lots of Irish and international retailers still take on additional staff at Christmas. Although many may have already hired their temporary Christmas staff, many of them continue to hire throughout the festive season. Bear in mind that the January sales can be just as busy as Christmas time for many retailers so they need staff right up until February. Check ‘Careers’ section of retailers’ websites: Ok, it’s common sense but it pays to regularly keep an eye on the ‘careers’ sections of companies you would like to work for, ready to take action when they post their notices looking for seasonal staff. Even if there is no direct way of applying for a seasonal job, take down the contact details for the company’s HR department and fire on your details. Keep your ear to the ground: In the current climate we all have a vested interest in whether things are going up or down in terms of the economy and how do we gauge this? Job creation! More specifically; job creation in the retail sector. With the number of stores that have either gone into liquidation or closed down over the past two years or so it is no surprise that we are filled with a temporary feeling of security when we hear that a retailer is hiring. Recently Marks and Spencer announced that would be hiring hundreds of temporary staff in Ireland and it was embraced as a newsworthy story. If you regularly visit news websites and listen out for radio bulletins you never know what you might hear. Use social media: Make it known that you are looking for work. In the Excel Recruitment office we love Linkedin. We think it is a great way to find excellent candidates that may not be on our database and we’re sure we are not the only ones so it is a great place to be. If you have a profile set up with your work information and education background, you can start linking in to people in retail organisations; there are thousands of them on Linkedin in Ireland from Sales Assistants to Directors so it is a fantastic way to get connected. Moreover, you can state in your summary that you are actively seeking work. Enlist the professionals: An effective way of making it known that you are looking for work is to register with a recruitment agency – such as ourselves - that has a number of clients in the retail industry. We are the leading specialists for the sector and we place 100s of retail candidates each year; and it doesn’t stop around Christmas time. Due to our history in the retail industry as well as recruitment we have built solid relationships with some of the biggest names in retail both in Ireland and internationally so we are confident looking for a role on your behalf if you have the experience. Finally – a personal note. While it is testing to look for work at any time of the year, it can be twice as stressful during the party season. The most important thing to do is keep applying for work but do not let it distract from the celebrations. Try your hardest not to let the situation get you down and remember to get into the full swing of Christmas spirit. Claire Kane of specialist retail and FMCG recruiter Excel Recruitment has some timely tips for job hunters seeking a position in the Irish retail sector in the run-up to Christmas – and beyond. Claire Kane is a Digital Marketing Executive with Excel Recruitment, a leading Irish recruitment agency specialising in the retail and FMCG sectors and with particular expertise in Food and Fashion. Excel MD Barry Whelan is also well known in the retail management and recruitment industry and is a member of Retail Excellence Ireland.